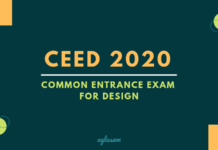 The CEED examination will be conducted in two parts. All candidates must answer both the parts. Part A is a computer-based screening test. It evaluates visualization and spatial ability, environmental and social awareness, analytical and logical reasoning, language and cretivity, observation and design sensitivity. Candidates who are shortlisted in Part A using the method mentioned in the brochure will qualify for the evaluation of Part B. Part B evaluates drawing, ceativity, communication skills and analytical and problem solving skills. Part B scores will be calculated using the method mentioned in the brochure. The final CEED score will be calculated by giving 25% weightage to marks obtained in Part A marks and 75% weightage to scores obtained in Part B.
M.Des admission – IISc Bangalore, IIT Bombay, IIT Delhi, IIT Guwahati, IIT Hyderabad, IIITDM Jabalpur, and IIT Kanpur. PhD Design admission – IISc Bangalore, IIT Bombay, IIT Guwahati, IIT Hyderabad, and IIT Kanpur. IIT Bombay only discloses the cutoff for the Part A of the examination. Part B is a subjective paper, hence, there can be no certain cutoff for it. Last year, CEED was held in 19 cities but this year it will be held in 20 cities. Bhopal is the new addition to the list. However, Kanpur, Indore, and Kozhikode have been replaced with Thrissur, Lucknow, and Vishakhapatnam. Candidates will have to submit three choices for the exam centre, on the application form. It should also be noted that the request to change the exam centre will not be entertained, esp when the candidates demand another centre in the allocated city. Duration – Candidates will get 1 hour to attempt Part A and to attempt Part B, the candidates will have to 2 hours. Language – Both the sections will be presented in the English language. 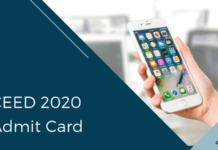 Mode of the Exam – Part A will be a computer-based examination. The questions for Part B will appear on the screen but the candidates will have to answer on a sheet of paper. Question Type – The Part A of the examination contains Objective Type questions, whereas, the questions in Part B will be designed to test candidates writing, drawing, and designing techniques/skills. Marking Scheme – The marking scheme of the examination, last year, was as below. Whether it will remain the same this year or not, will announce through the information brochure. Note: There is negative marking of 0.6 marks in NAT questions. 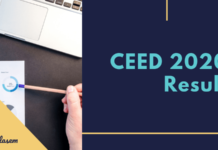 The CEED syllabus is as mentioned below. It is provided for Part A, as well as Part B of the examination. Brush Up Skills – The more the candidates will practice, the better their drawing and other skills will get. Hence, it is advised that candidates practice as much as they can. Follow a Timetable – The candidates are advised to follow a certain timetable for preparation. Making a timetable does not mean that the candidate needs to dedicate each and every minute of their day to exam preparation. Instead, it will help candidates in keep the preparation regular. Best Books: A good book is a guide. Hence, it is vital to prepare by from a good book. Some of the best books for CEED Preparation are as mentioned below. The following institutes will grant admission on the basis of CEED. The candidates will get admission in the following courses. Note: For the courses with (*), GATE qualified candidates may also apply.